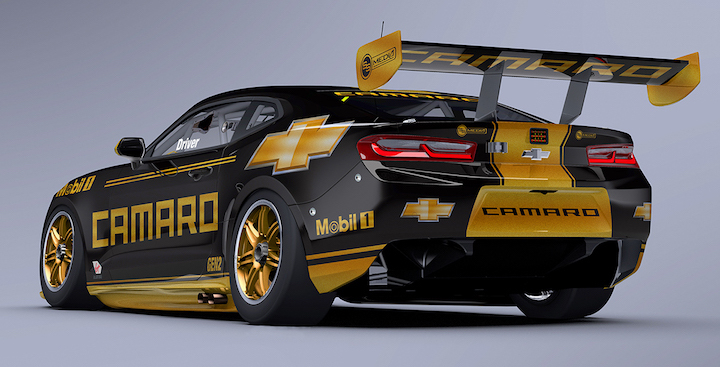 Walkinshaw Andretti United and Chevrolet delayed development of the new Camaro body for the Australian Supercars series as the vehicle could not be properly modified to adhere to the series’ regulations. Ford, meanwhile, decided to press forward with its Mustang body for the series, fitting a Mustang-shaped body over the Supercars’ sedan-shaped control chassis. This, not surprisingly, has resulted in an awkward-looking Mustang race car that doesn’t really resemble its road-going counterpart. Walkinshaw considered doing the same with the Camaro, but the Chevy’s raked windshield and narrow side and rear windows made it pretty much impossible. This hasn’t stopped Australian fans from demanding the muscle car be included in the race series though – a potentially good sign for the future of General Motors‘ performance car business down under. The problem for the Camaro relates to the series’ minimum mandated roll cage height, which was set when manufacturers were racing sedans only. In order for the team to build a proper Camaro body, the rules would have to change to allow for roll cages that are around 50-80mm lower. Walkinshaw is currently in talks with the series about making a concession for the car, although it’s believed that implementing such a drastic measure won’t be easy, as having a lower roof height would give the Camaro an advantage over the Mustang with regard to the center of gravity. Subscribe to GM Authority (for free) for the latest Camaro news, Chevrolet news, as well as around-the-clock GM news coverage. There are a lot of politics going on right now and they need Chevy more than Chevy needs them. Look for an agreement to come . Also i get the feeling the next gen Camaro is not as far away as some think it is. The Alpha 2 arrives next year at Cadillac and the new platform will bring the RHD they need down under with no major costly modification. With the C8 transcending to a mid-engine platform, I think the Camaro will eventually grow to fill the empty space that the Corvette leaves behind. Australia Supercar needs to fix its rule. I don’t want to see Camaro follows Mustang that terrible look. Australian supercar it is no longer…..
3″ off the roof line is also a huge aero benefit. Significantly lower frontal area, smoother transition from the roof to the rear deck lid, and cleaner air to the rear wing. Why don’t they use production vehicles, built to FIA GT3 rules with GTLM power? Ford and Chevy can both make 500-600bhp, restricted.